This article is about the northern part of the U.S. state of California. For the historic region, see Alta California. For the megaregion, see Northern California Megaregion. "No Cal" redirects here. For the soft drink, see No-Cal. Clockwise: California State Capitol in Sacramento, Golden Gate Bridge, San Francisco skyline, San Jose skyline, Muir Woods National Monument, the northern California coast as seen from Muir Beach Overlook, view of the California side of Lake Tahoe and Natural Bridges State Beach in Santa Cruz. Northern California (colloquially known as NorCal) is the northern portion of the U.S. state of California. Spanning the state's northernmost 48 counties its main population centers include the San Francisco Bay Area (anchored by the cities of San Jose, San Francisco, and Oakland), the Greater Sacramento area (anchored by the state capital Sacramento), and the Metropolitan Fresno area (anchored by the city of Fresno). Northern California also contains redwood forests, along with the Sierra Nevada, including Yosemite Valley and part of Lake Tahoe, Mount Shasta (the second-highest peak in the Cascade Range after Mount Rainier in Washington), and most of the Central Valley, one of the world's most productive agricultural regions. 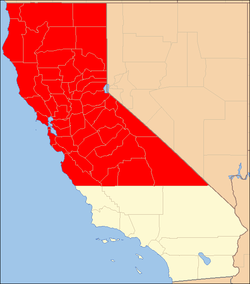 The 48-county definition is not used for the Northern California Megaregion, one of the 11 megaregions of the United States. The megaregion's area is instead defined from Metropolitan Fresno north to Greater Sacramento, and from the Bay Area east across Nevada state line to encompass the entire Lake Tahoe-Reno area. Native Americans arrived in northern California at least as early as 8,000 to 5,000 BC and perhaps even much earlier, and successive waves of arrivals led to one of the most densely populated areas of pre-Columbian North America. The arrival of European explorers from the early 16th to the mid-18th centuries did not establish European settlements in northern California. In 1770, the Spanish mission at Monterey was the first European settlement in the area, followed by other missions along the coast—eventually extending as far north as Sonoma County. The state is often considered as having an additional division north of the urban areas of the San Francisco Bay Area and Sacramento metropolitan areas. Extreme northern residents have felt under-represented in state government and in 1941 attempted to form a new state with southwestern Oregon to be called Jefferson, or more recently to introduce legislation to split California into two or three states. The coastal area north of the Bay Area is referred to as the North Coast, while the interior region north of Sacramento is referred by locals as the Northstate. Northern California is the name of a proposed new state on the 2018 California ballot created by splitting the existing state into three parts. Since the events of the California Gold Rush, Northern California has been a leader on the world's economic, scientific, and cultural stages. From the development of gold mining techniques and logging practices in the 19th century that were later adopted around the world, to the development of world-famous and online business models (such as Apple, Hewlett-Packard, Google, Yahoo!, and eBay), northern California has been at the forefront of new ways of doing business. In science, advances range from being the first to isolate and name fourteen transuranic chemical elements, to breakthroughs in microchip technology. Cultural contributions include the works of Ansel Adams, George Lucas, and Clint Eastwood, as well as beatniks, the Summer of Love, winemaking, the cradle of the international environmental movement, and the open, casual workplace first popularized in the Silicon Valley dot-com boom and now widely in use around the world. Other examples of innovation across diverse fields range from Genentech (development and commercialization of genetic engineering) to CrossFit as a pioneer in extreme human fitness and training. It is also home to one of the largest Air Force Bases on the West Coast, and the largest of California, Travis Air Force Base. Northern California's largest metropolitan area is the San Francisco Bay Area which includes the cities of San Francisco, San Jose, Oakland, and their many suburbs. In recent years the Bay Area has drawn more commuters from as far as Central Valley cities such as Sacramento, Stockton, Fresno, Turlock and Modesto. With expanding development in all these areas, the San Francisco Bay Area, Monterey Bay Area, and central part of the Central Valley and Sierra Nevada foothills may now be viewed as part of a single megalopolis. The 2010 U.S. Census showed that the Bay Area grew at a faster rate than the Greater Los Angeles Area while Greater Sacramento had the largest growth rate of any metropolitan area in California. The state's larger inland cities are considered part of Northern California in cases when the state is divided into two parts. Important cities in the region not in major metropolitan areas include Eureka on the far North Coast, Redding, at the northern end of the Central Valley, Chico, and Yuba City in the mid-north of the Valley, as well as Fresno and Visalia on the southern end. Though smaller in every case except for Fresno than the larger cities of the vast region, these smaller regional centers are often of historical, and perhaps inflated economic importance for their respective size, due to their locations, which are primarily rural or otherwise isolated. San Francisco, the second most populated city in Northern California and the leading economic center of the San Francisco Bay Area, its most populous metropolitan area (4.7 million residents) and the 14th largest in the United States. Oakland, the center of Northern California's African American community. Sacramento, The capital city of California and the principal city of the Sacramento metropolitan area (2.5 million residents). San Jose, the most populous city in Northern California and tenth largest in the United States, is the center of Silicon Valley, the preeminent region for technology in the US (1.9 million residents). Inhabited for millennia by Native Americans, from the Shasta tribe in the north, to the Miwoks in the central coast and Sierra Nevada, to the Yokuts of the southern Central Valley, northern California was among the most densely populated areas of pre-Columbian North America. The first European to explore the coast was Juan Rodríguez Cabrillo, sailing for the Spanish Crown; in 1542, Cabrillo's expedition sailed perhaps as far north as the Rogue River in today's Oregon. Beginning in 1565, the Spanish Manila galleons crossed the Pacific Ocean from Mexico to the Spanish Philippines, with silver and gemstones from Mexico. The Manila galleons returned across the northern Pacific, and reached North America usually off the coast of northern California, and then continued south with their Asian trade goods to Mexico. In 1579, northern California was visited by the English explorer Sir Francis Drake who landed north of today's San Francisco and claimed the area for England. In 1602, the Spaniard Sebastián Vizcaíno explored California's coast as far north as Monterey Bay, where he went ashore. Other Spanish explorers sailed along the coast of northern California for the next 150 years, but no settlements were established. The first European inhabitants were Spanish missionaries, who built missions along the California coast. The mission at Monterey was first established in 1770, and at San Francisco in 1776. In all, ten missions stretched along the coast from Sonoma to Monterey (and still more missions to the southern tip of Baja California). In 1786, the French signaled their interest in the northern California area by sending a voyage of exploration to Monterey. The first twenty years of the 19th century continued the colonization of the northern California coast by Spain. By 1820, Spanish influence extended inland approximately 25 to 50 miles (80 km) from the missions. Outside of this zone, perhaps 200,000 to 250,000 Native Americans continued to lead traditional lives. The Adams-Onís Treaty, signed in 1819 between Spain and the young United States, set the northern boundary of the Spanish claims at the 42nd parallel, effectively creating today's northern boundary of northern California. Russians, from Alaska, were moving down the coast, and in 1812 established Fort Ross, a fur trading outpost on the coast of today's Sonoma County. Fort Ross was the southernmost point of expansion, meeting the Spanish northern expansion some 70 miles (113 km) north of San Francisco. In 1841, as the American presence in northern California began to increase and politics began to change the region, a deal was made with John Sutter and the Russians abandoned their northern California settlements. After Mexico gained independence from Spain in 1821, Mexico continued Spain's missions and settlements in northern California as well as Spain's territorial claims. The Mexican Californios (Spanish-speaking Californians) in these settlements primarily traded cattle hides and tallow with American and European merchant vessels. Coast Redwoods in Muir Woods National Monument, in Marin County. In 1825, the Hudson's Bay Company established a major trading post just north of today's Portland, Oregon. British fur trappers and hunters then used the Siskiyou Trail to travel throughout northern California. The leader of a further French scientific expedition to northern California, Eugene Duflot de Mofras, wrote in 1840 "...it is evident that California will belong to whatever nation chooses to send there a man-of-war and two hundred men. ":260 By the 1830s, a significant number of non-Californios had immigrated to northern California. Chief among these was John Sutter, a European immigrant from Switzerland, who was granted 48,827 acres (197.60 km2) centered on the area of today's Sacramento. American trappers began entering northern California in the 1830s. :263–4 In 1834, American visionary Ewing Young led a herd of horses and mules over the Siskiyou Trail from missions in northern California to British and American settlements in Oregon. Although a small number of American traders and trappers had lived in northern California since the early 1830s, the first organized overland party of American immigrants to arrive in northern California was the Bartleson-Bidwell Party of 1841 via the new California Trail. :263–273 Also in 1841, an overland exploratory party of the United States Exploring Expedition came down the Siskiyou Trail from the Pacific Northwest. In 1846, the Donner Party earned notoriety as they struggled to enter northern California. When the Mexican–American War was declared on May 13, 1846, it took almost two months (mid-July 1846) for word to get to California. On June 14, 1846, some 30 non-Mexican settlers, mostly Americans, staged a revolt and seized the small Mexican garrison in Sonoma. They raised the "Bear Flag" of the California Republic over Sonoma. The "Bear Flag Republic" lasted only 26 days, until the U.S. Army, led by John Frémont, took over on July 9. The California state flag today is based on this original Bear Flag, and continues to contain the words "California Republic." Commodore John Drake Sloat ordered his naval forces to occupy Yerba Buena (present San Francisco) on July 7 and within days American forces controlled San Francisco, Sonoma, and Sutter's Fort in Sacramento. The treaty ending the Mexican–American War was signed on February 2, 1848, and Mexico formally ceded Alta California (including all of present-day northern California) to the United States. Moon Lake in Lassen County, California. The California Gold Rush took place almost exclusively in northern California from 1848–1855. It began on January 24, 1848, when gold was discovered at Sutter's Mill in Coloma. News of the discovery soon spread, resulting in some 300,000 people coming to California from the rest of the United States and abroad. San Francisco grew from a tiny hamlet of tents to a boomtown, and roads, churches, schools and other towns were built. New methods of transportation developed as steamships came into regular service and railroads were built. However, the Gold Rush also had negative effects: Native Americans were attacked and pushed off traditional lands, the native oyster species became overharvested and nearly wiped out all the way into the Pacific Northwest, and gold mining caused environmental harm. The Gold Rush also increased pressure to make California a U.S. state. Pro-slavery politicians initially attempted to permanently divide northern and southern California at 36 degrees, 30 minutes, the line of the Missouri Compromise. But instead, the passing of the Compromise of 1850 enabled California to be admitted to the Union as a free state. The decades following the Gold Rush brought dramatic expansion to northern California, both in population and economically – particularly in agriculture. The completion of the First Transcontinental Railroad in 1869, with its terminus in Sacramento, meant that northern California's agricultural produce (and some manufactured goods) could now be shipped economically to the rest of the United States. In return, immigrants from the rest of the United States (and Europe) could comfortably come to northern California. A network of railroads spread throughout northern California, and in 1887, a rail link was completed to the Pacific Northwest. Almost all of these railways came under the control of the Southern Pacific Railroad, headquartered in San Francisco, and San Francisco continued as a financial and cultural center. Substantial tensions during this era included nativist sentiments (primarily against Chinese immigrants), tensions between the increasing power of the Southern Pacific Railroad and small farmers, and the beginnings of the labor union movement. Northern California's economy is noted for being the de facto world leader in industries such as high technology (software, semiconductor/micro-electronics, biotechnology and medical devices/instruments), as well as being known for clean power, biomedical, government, and finance. Other significant industries include tourism, shipping, manufacturing, and agriculture. Its economy is diverse, though more concentrated in high technology, and subject to the whims of venture capital than any other major regional economy in the nation especially within Silicon Valley, and less dependent on oil and residential housing than Southern California. It is home to the state capital, as well as several Western United States regional offices in San Francisco, such as the Federal Reserve and 9th Circuit Court. Northern California has warm or mild to cold climate, in which the Sierra gets snow in the late fall through winter and occasionally into spring. Summers are mild along the coast and generally warm and dry, while winters are cool and usually wet. The high temperatures range from 50s to 30s in the winters while summers temperature range is 90s to 60s or 50s, with highs well into the 100s for the Sacramento region. Snow covers the mountains (generally above 3000 feet) in mid January through February. Fog occurs infrequently or occurs normally in the west and coast, especially in the summer, creating some of the coolest summer conditions in North America. The largest percentage increase outside the Gold Rush era (51%) came in the decade of the 1940s, as the area was the destination of many post-War veterans and their families, attracted by the greatly expanding industrial base and (often) by their time stationed in northern California during World War II. The largest absolute increase occurred during the decade of the 1980s (over 2.1 million person increase), attracted to job opportunities in part by the expansion taking place in Silicon Valley and the Cold War era expansion of the defense industry. The 2010 U.S. Census revealed that northern California grew at a faster rate than Southern California in the 2000s with a rate slightly higher than the state average. The U.S. National Park System controls a large and diverse group of parks in northern California. The best known is Yosemite National Park, which is displayed on the reverse side of the California state quarter. Other prominent parks are the Kings Canyon-Sequoia National Park complex, Redwood National Park, Pinnacles National Park, Lassen Volcanic National Park and the largest in the contiguous forty-eight states, Death Valley National Park. Other areas under federal protection include Muir Woods National Monument, Giant Sequoia National Monument, Devils Postpile National Monument, Lava Beds National Monument, Point Reyes National Seashore, the Monterey Bay National Marine Sanctuary, and the Cordell Bank and Gulf of the Farallones National Marine Sanctuaries (both off the coast of San Francisco). Included within the latter National Marine Sanctuary is the Farallon National Wildlife Refuge; this National Wildlife Refuge is one of approximately twenty-five such refuges in northern California. National forests occupy large sections of northern California, including the Shasta-Trinity, Klamath, Modoc, Lassen, Mendocino, El Dorado, Tahoe, and Sequoia national forests, among others. Included within (or adjacent to) national forests are federally protected wilderness areas, including the Trinity Alps, Castle Crags, Granite Chief, and Desolation wilderness areas. In addition, the California Coastal National Monument protects all islets, reefs, and rock outcroppings from the shore of northern California out to a distance of 12 nmi (22 km), along the entire northern California coastline. In addition, the National Park Service administers protected areas on Alcatraz Island, the Golden Gate National Recreation Area, and the Whiskeytown National Recreation Area. The NPS also administers the Manzanar National Historic Site in Inyo County, the Rosie the Riveter/World War II Home Front National Historical Park in Richmond, and the Tule Lake Unit of the World War II Valor in the Pacific National Monument outside of Tulelake. Northern California hosts a number of world-renowned universities including Stanford University and University of California, Berkeley. Top-tier public graduate schools include Boalt Hall and Hastings law schools and UC San Francisco, a top-ranked medical school, and UC Davis School of Veterinary Medicine, the largest vet school in the United States. The historic San Francisco Ferry Building is the busiest ferry terminal on the West Coast and connects Downtown San Francisco to various parts of the Bay Area. See also: Category:San Francisco Bay Area freeways. The Golden Gate Bridge is one of northern California's most well known landmarks and one of the most famous bridges in the world. 209 — Northern San Joaquin Valley (Stockton, Modesto, and Merced). 408 — Most of Santa Clara County (San Jose and Gilroy). 415 — San Francisco, Daly City, and Marin County. One of the three original Area Codes in California. 510 — Inner East Bay (Oakland, Berkeley, Richmond, and Fremont). Originally part of area code 415. 530 — A large northeastern section of the region including Tehama County, Shasta County, Lassen County, Yuba County, Sutter County, Butte County, and Nevada County. Split from area code 916 in 1997–1998. 559 — Southern San Joaquin Valley (Madera, Fresno, and Visalia). 628 — Overlay with 415. 650 — San Francisco Peninsula (San Mateo, Redwood City, and Palo Alto). Originally part of area code 415. 669 — Overlay with 408. 707 — The North Coast section of the region from Sonoma County to the Oregon border. Cities include Eureka, Ukiah, Santa Rosa, Napa, Vallejo and Fairfield. 831 — Monterey, San Benito and Santa Cruz Counties. Originally part of area code 408. 916/279 — Sacramento County and the Sacramento suburbs in western Placer and El Dorado Counties. One of the three original area codes in California, formerly covered all areas now within 530. 925 — Outer East Bay (Concord, Pittsburg, Walnut Creek, San Ramon, Pleasanton and Livermore). Originally part of area codes 415 and 510. ^ Morgan, Neil (April 19, 1963). "Westward Tilt: Northern California". Lodi News-Sentinel. Lodi, California. Retrieved September 7, 2014. ^ a b Metcalf, Gabriel; Terplan, Egon (November–December 2007). "The northern California megaregion". The Urbanist. San Francisco Planning and Urban Research Association. Retrieved November 21, 2009. ^ Wiles, Tay (January 22, 2018). "A separatist state of mind". High Country News. Archived from the original on June 17, 2018. Retrieved August 23, 2018. ^ Myers, John. "Radical plan to split California into three states earns spot on November ballot". Latimes.com. Retrieved June 14, 2018. ^ R.F. Heizer (1966). "California Indian Tribes map". CaliforniaPrehistory.com. Retrieved February 10, 2007. ^ "Juan Rodríguez Cabrillo: A Voyage of Discovery". U.S. National Park Service. Retrieved February 10, 2007. ^ "Hunters and Trappers at Upper Soda Springs". Museum of the Siskiyou Trail. Retrieved February 10, 2007. ^ a b c Bancroft, Hubert Howe (1886). History of California, 1840–1845, Volume 4. A. L. Bancroft. OCLC 9475460. ^ "Sutter's Fort Historic State Park". California Department of Parks & Recreation. Retrieved February 10, 2007. ^ a b "American Transition to Early Statehood". California Department of Parks & Recreation. Retrieved February 10, 2007. ^ "[E]vents from January 1848 through December 1855 [are] generally acknowledged as the 'Gold Rush' .... After 1855, California gold mining changed and is outside the 'rush' era." "The Gold Rush of California: A Bibliography of Periodical Articles". California State University, Stanislaus. 2002. Retrieved January 23, 2008. ^ "Historical census data by U.S. Census Bureau". Web.archive.org. Retrieved February 6, 2019. ^ Bureau, U. S. Census. "American FactFinder - Results". Factfinder.census.gov. Retrieved February 6, 2019. ^ Population figures are the most recent figures contained in the respective Wikipedia articles, in the List of cities in California (by population), or in the State of California, Department of Finance 2007 estimates Archived March 10, 2008, at the Wayback Machine. ^ "Passenger Boarding (Enplanement) and All-Cargo Data for U.S. Airports – Airports". Faa.gov. Retrieved February 6, 2019. ^ For current information, see nanpa.com, the North American Numbering Plan Administration site. Wikimedia Commons has media related to Northern California.